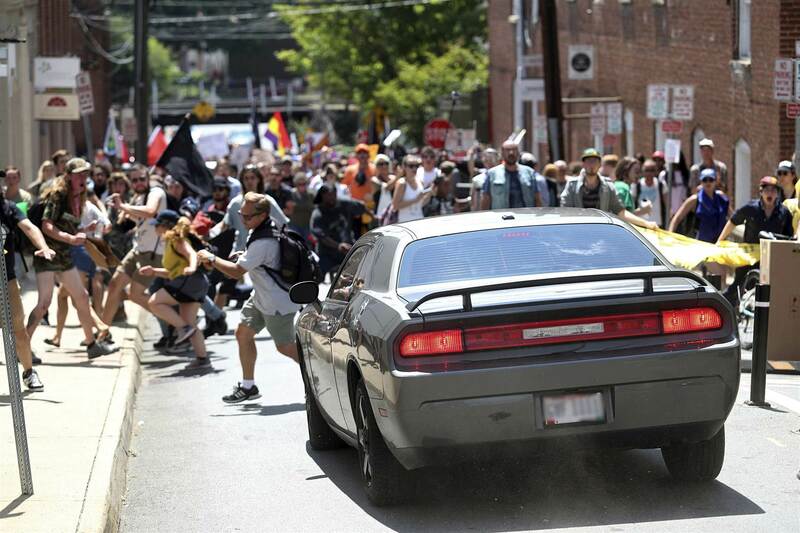 A woman died and over 19 more were injured when James Alex Fields rammed his car into a crowd of counter-protesters during a weekend of white supremacist terrorism in Charlottesville, VA. We still don't know to what extent Fields will be held accountable for his actions. But Republican lawmakers have introduced laws in SIX states that would seek to PROTECT people, like Fields, who run their cars through a protest and hit or injure protesters. Any lawmaker with the audacity to stand behind this legislation after the terrorism we witnessed in Charlottesville is a disgrace. North Carolina is the only state where this legislation is still active and could become law. So that we're clear: this new legislation, which started in North Dakota in reaction to the #NoDAPL protests, is not popping up due to a surge of lawsuits against harmless people accidentally hitting people who are blocking the street. At best, these bills are intended to suppress and control protest, specifically the protest of Black and brown communities fighting for their right to exist in this world. And at worst, they are an open invitation for people to ram cars into protestors with reckless abandon. What happened in Charlottesville is the exact reason no law protecting those who hurt protesters should ever exist. Yet, the bill has passed in the North Carolina State House and is actually poised to become law in the Senate where Republicans have a majority. Will you join us in telling the North Carolina State Senate to stand against hate and vote 'NO' on this horrendous bill? On Saturday, August 12th, 2017 a terrorist attack occurred in Charlottesville, Virginia. The disturbing and vile presence of a white supremacist rally in Charlottesville was in full force. The end result cost the life of a young woman, Heather Heyer, after a white supremacist drove his car into a crowd of protesters who were simply doing the right thing -- fighting back against the racist and violent rally. We cannot ignore that this horrific event is now ingrained in our country’s history. It is troubling that North Carolina lawmakers are moving forward with a deadly legislation that would lawfully protect drivers who use their vehicles as weapons to intimidate and harm people who engage in protest. This type of legislation is a blatant attempt to suppress people’s constitutional right to protest. More dangerously, this type of legislation is being used to control and silence the Black and Brown communities who are fighting tirelessly for a more just and equitable society for all of us to live in. North Carolina cannot afford to be on the wrong side of history. I am writing to demand that the North Carolina State Senate vote NO on this bill. We ask that you instead work to erase the violence and hatred that is seeping through this country. If this bill becomes law it will only start a harmful trend of people with racists motives using their cars to ram through crowds of people causing injuries and even death. As elected leaders, we believe your job is first and foremost to protect people and represent the values of justice, freedom, and equality. We ask that you do not give into hate and bigotry. Vote NO.